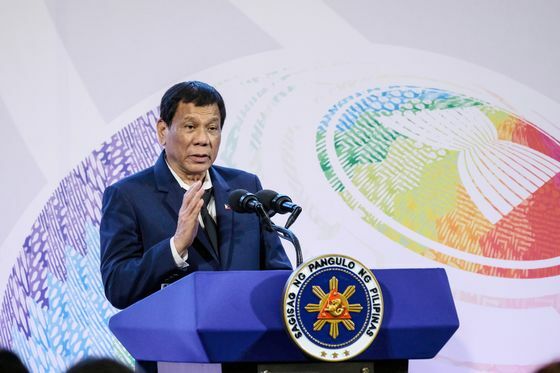 (Bloomberg) -- Philippine President Rodrigo Duterte’s popularity bounced back to its highest since he assumed the presidency, over a month before midterm elections that will determine if he retains control of Congress. Net satisfaction, used by Social Weather Stations as approval marks of the president’s performance, rose six points to 66 percent during the first quarter of 2019, according to results of the pollster’s nationwide survey. That matched a previous high in June 2017. All areas, age groups and genders gave him higher ratings, the survey firm said on its website. The only decrease in the 74-year old leader’s rating was observed among the “extremely poor,” who gave him a lower score of 58 percent from 65 percent in December. The survey results bode well for Duterte and his candidates for the midterm elections on May 13, when millions of Philippine voters will elect lawmakers and local government leaders. The president has been actively campaigning for his chosen candidates for half of seats in the 24-member Senate, saying he needs allies to continue his campaign against illegal drugs, crime and corruption. The survey was conducted from March 28 to 31, amid a water shortage in the capital that triggered scrutiny of Duterte’s loan deals with China for dam and irrigation projects. Inflation, which rose to highest in nine years last year, has eased in the last five months. A critic of the President, journalist Maria Ressa, was also arrested during this period for alleged violation of foreign ownership ban on media -- an accusation which she denies.